My self Abhilash soman who is practising and teaching yoga for the last 12 yrs . 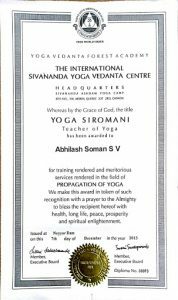 I have started with SIVANANDA and got the opportunity to train with some of the masters in India. "Yes, I know Abhilash Soman very well as a Yoga trainer.. I have personally attended his workshops and also have invited him as a guest faculty in many of the psychology and wellness workshops that I have organized. And without an iota of doubt I can say that he is the best out of around 10-12 yoga trainers I have encountered in my life because he is genuinely interested in the progress of his clients and he constantly upgrades and he is an exemplar by his action and conduct.And his command over English and Hindi makes him an excellent communication expert too.... And people just love him." "So much to say about Abhi yoga retreat. 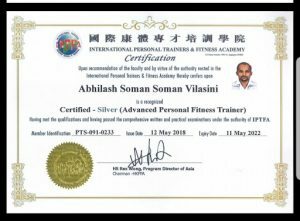 I have been to so many trainers and Abhi's style of making every exercise so easy and simple and certainly we end up doing every exercise which we have thought of not being able to do. His awareness of the surroundings keenness in work and so much zeal while showing the exercises shows how true he is in his work. He makes every person very comfortable. He works on our outcome of Health and certain limiting beliefs of mind and that becomes so much fun and ease to reach the target goal. Every nerve can feel the breath every cell get rejuvenated because he breathes in yoga and he lives a life of yoga. It was great to be part of abhi's sessions. Thank you coach to make me see the real me. And to build the confidence which made me to achieve my goal in weight loss and inch loss in a very authentic way. Thank you so much from bottom of my heart.Radha Chintala"